Hotelcard is a simple proposition: a €99 per year subscription that offers the holder a 50% discount on hotel bookings across Europe. The hotel bookings market is richly-contested, with a number of competing websites vying for the custom of travellers and the participation of hotels. Hotelcard takes a different approach to this crowded market, with a clear and transparent offering whose costs and benefits to both the hotelier and the visitor are easily gauged. Hotelcard’s concept and product are both new. As a newcomer seeking space amongst much more established competitors, the advantages of the product needed to be accompanied by a website that delivered what it promised right from the start, and be able to keep up with potentially sudden and massive growth. At the heart of the Hotelcard site is django CMS, an almost-infinitely expandable starting-point for developing well-structured websites. A suite of sophisticated database-driven applications is integrated into django CMS, providing the user with interactive functionality (rapidly-updating maps, search, booking) and allow hotels’ data (availability, pricing and so on) to be kept up-to-date with ease. Our new hotelcard.com was a big step for us. Not just a new website, it was also a brand new platform, a new technology and a new hosting partner. Thanks to the comprehensive on-boarding support we received from Divio, our development teams were quickly up-to-speed with Python and Django. The modern technology powering the site gives us peace of mind, and we’re looking forward to taking on the next challenges for Hotelcard as we grow. We’re confident that we’re now equipped with the best tools to face an exciting future. The work of editors on the new site is faster, easier and more enjoyable. The django CMS platform at the heart of the site provides flexibility that previously was simply not possible. Working with the site's responsive layout, editors can make substantial changes without either needing to make changes to templates, or running the risk of disrupting the site's design or frontend behaviour. The modular architecture of the new site, based around a suite of applications running as microservices, will make it significantly easier to maintain and update. Running headlessly, these applications are equally-well suited to passing data for rendering to web services, native mobile applications or even other data processing applications. 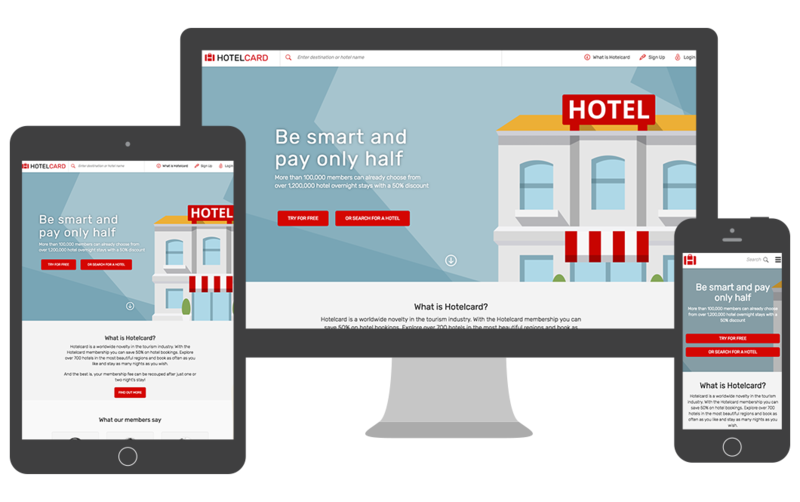 Hotelcard’s previous site was built on PHP and was running up against the limitations of that technology. Rebuilt entirely in Python and Django, all the existing functionality was rapidly implemented using modern, extensible software. As well as being more maintainable, the new codebase is also more performant and reliable. The new Hotelcard site is deployed on the Divio Cloud, providing a seamless desktop-to-production development workflow, and guarantees of rapid and almost limitless scaling. One challenge in the project requirements was the need to maintain the existing site in parallel with the new build, including synchronisation of all site data in both directions. Custom Python modules were developed to use the OpenTravel messaging standard, and will serve to allow future data import/export and integration with other services. ElasticSearch and Amazon QuickSight business analytics integration provide essential services to end-users, whether hotel managers or visitors. The final result is compact, maximally-compatible and optimised - important for users who are likely to be using the site while travelling - while the code-base remains well-structured and maintainable. Divio helped recruit and select members of the Hotelcard development team, and led the initial development phase of the project. A formal process of on-boarding rapidly brought the Hotelcard developers up to speed, putting them in a position to take ownership of the project’s development. As the project proceeded, responsibility for development progressively moved to the Hotelcard team. Their frontend team, previously unfamiliar with Django, were able to learn its powerful templating system and language in short order. The clean separation of concerns that all Python/Django projects can benefit from made it possible to build backend components entirely independently of the frontend, and even while concepts of the site’s frontend behaviour were being developed, modified and implemented. The Divio Cloud puts control over deployment into the hands of Hotelcard’s development team for the first time; they no longer need to rely on dedicated DevOps or system administrators to deploy new software or manage the site’s resources. As Hotelcard grows, with new market regions representing potential step-changes in scale, the new site’s modern Django applications and Divio Cloud hosting will be able to keep up with everything that is demanded of it. To celebrate the new site, Hotelcard is offering €50 discount to new subscribers, available using the code SPECIAL49.